Snook:They can be identified by a black line running from the gill to tail. There lower jaw sticks out over the upper. They are very sensitive to the water temperature change, moon phase, and tide. Is a seasonal fish that happens to inhabit the local waters of Charlotte Harbor year around. They are a very smart fish and you may get a few jumps out of them, but be careful snook will utilize any structure around to cut your line. Snook average weight is 5-10 lbs. Trophy size is 40+ inches. Bait fish of choice is pilchards, pinfish, and shrimp, artificial can be used like plugs, plastics, and spoons. 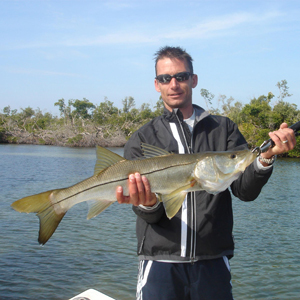 Snook are found from central Florida south, usually inshore in coastal and brackish waters. They are also common along mangrove shorelines, seawalls, and bridges. Snook are also on reefs and around pilings nearshore. They congregate in large schools during summer in deep passes and inlets to spawn. Snook begin life as males, but between 18 and 22 inches long some become females. Spawning occurs primarily in summer. Snook school along shore and in passes during spawning season. They feed on fish and large crustaceans. They orient themselves to face moving water and wait for prey to be carried down the current. Snook jump clear of the water, and burst into long runs. Use live pinfish, small mullet, shrimp, or sardines free-lined or fished off the bottom with a fish finder rig. They take a large variety of lures based on water conditions. Beware of the snook's razor-sharp gill covers! Snook make excellent table fare.